More often than not, some creative designer and innovative people turn something that appear useless into something very useful. While others give it a different function and usage. This is what happened to a garage that once was a rumble and didn’t looked pleasing at all. The once ugly and boring garage was turned into a stunning modern home. The owner Jeremie Buchholtz is a photographer who wanted to get a place of his own without spending too much. 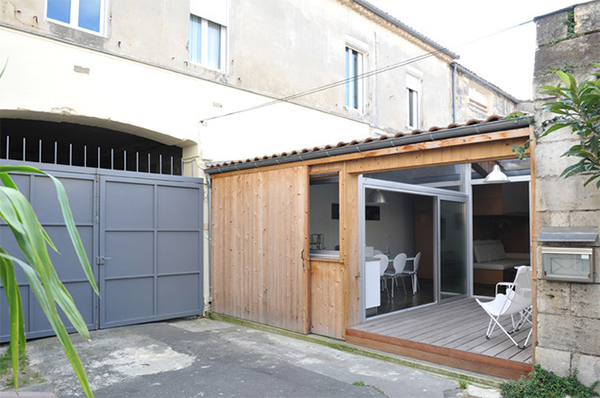 When he found out that a garage was for sale, he immediately bought it and asked the architecture firm FABRE/deMARIEN to transform it into a living space. They worked for 6 months to finish the 441 square foot garage and resulted into a space-saving modern dwelling. 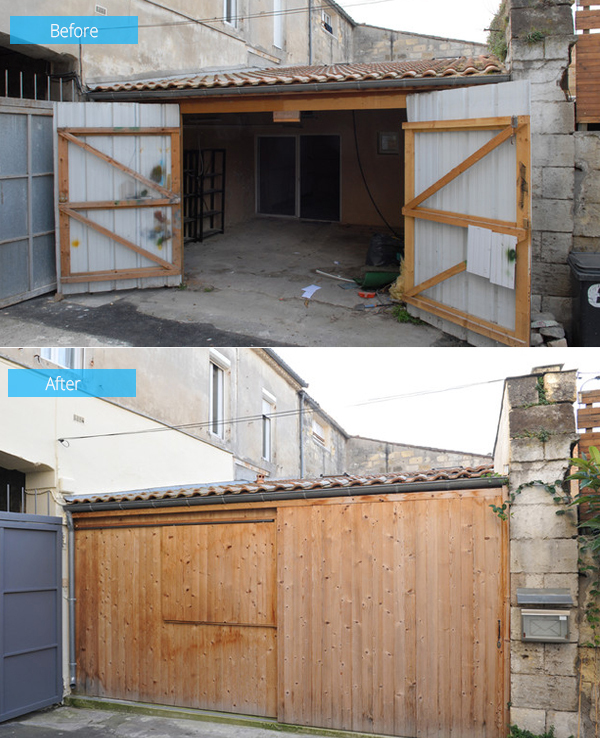 The once dilapidated garage was turned into a home. The concrete floors were kept as well as the main structure but the rest were redone. 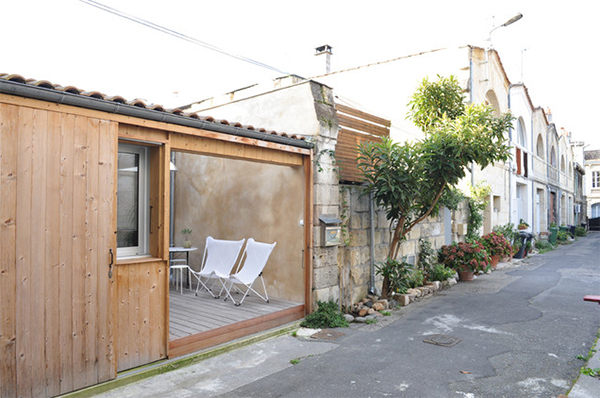 The garage is located close to the city center along the street on the East Bank of the Rive Droite in Bordeaux, France. 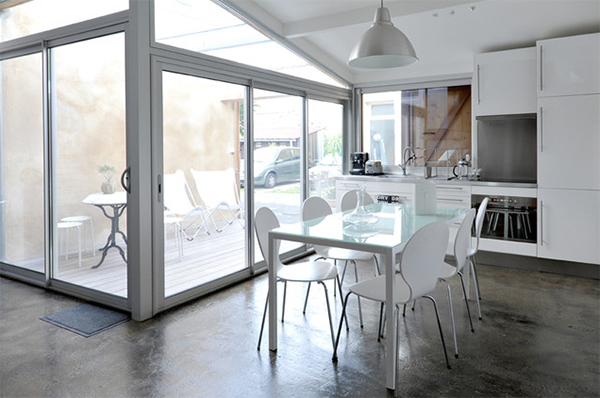 When you enter the house, you get into 13’x7′ patio that ha sliding glass doors. Electrical and plumbing were added to the garage to accommodate a kitchen. The center of the house is a 12’x10’x10′ wooden cube that hides a shower, sink, bathroom, dressing room, toilet and a washing machine. 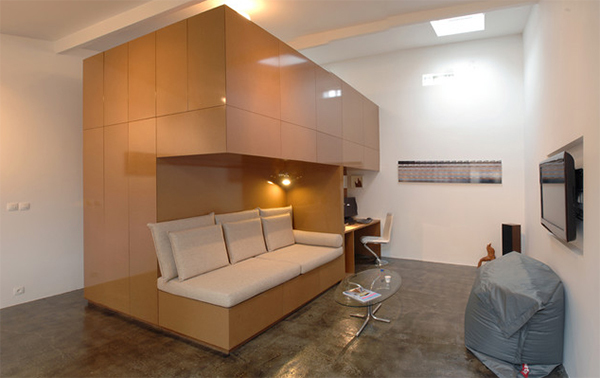 It also has a built in desk, a sofa that can be converted into a bed and some storage space. Amazing, right? On top of the cube is a small sleeping area with clothes storage too. A skylight was added to the bedroom to allow natural light it. This is the sofa that is convertible into a bed for guests. You can also see here the work area with computers. 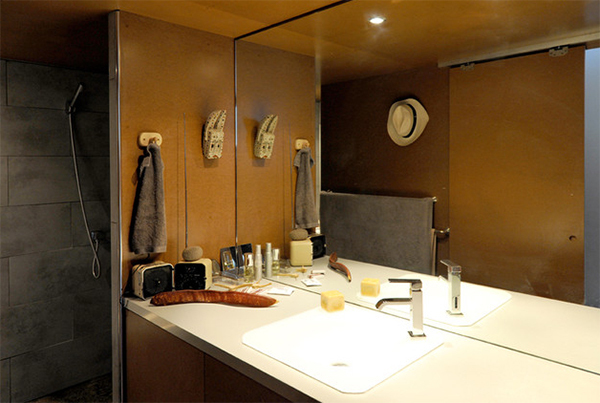 Everything is functional inside the house while the living essentials were hidden in the cube for privacy. This is the shower are inside the cube. The toilet is hidden underneath the stairs of the cube. 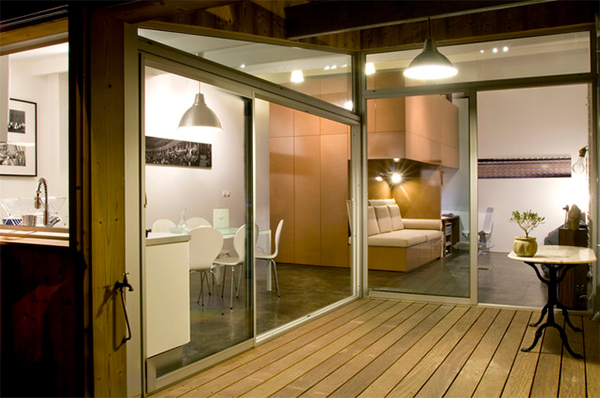 They used wood panels for the lockable sliding door that opens the home to the street. What Fabre/deMARIEN did to this garage is amazing. Just look at how it turned out to be! 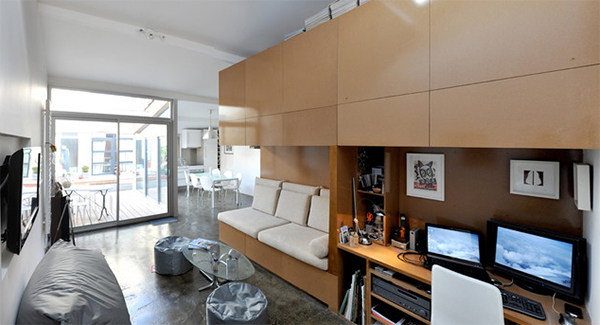 Definitely a gorgeous bachelor’s pad that is fitting to the lifestyle and work of the owner. I especially love the cube that is the center of the home. It would be nice to apply that to future projects!